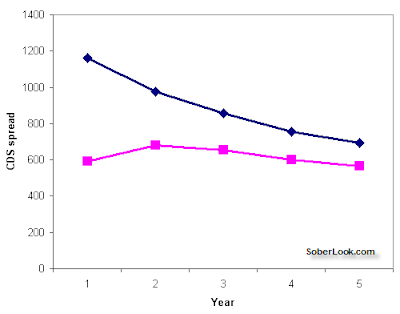 Sober Look: CDS curves are moving to pre-crisis "normal"
CDS curves are moving to pre-crisis "normal"
As the corporate bond market opened for business this year, it slowly became clear that many corporations, even ones with poor business models, may be able to refinance their debt. The market just has that much appetite for paper. The number of expected defaults in the near-term has dropped off significantly (thanks in large part to all the liquidity chasing yield). That means that the high front-loaded default probabilities of corporate debt in the CDS markets are shifting further out in time and falling overall. The CDS curves that have been highly inverted for some vulnerable names are starting to flatten or even become normalized (spreads increasing with term). Nobody thinks Ford is out of the woods on a long-term basis, but it took mostly just a reduction in the front-end default risk to change the shape that much. To get a feel of how a drop in near-term default probability drives the shape of the CDS curve, here is a simple illustration. 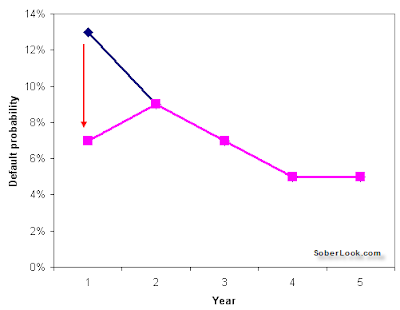 The chart below shows a hypothetical default probability curve (probabilities for each year). This effect is now seen across the corporate credit markets, with CDS curves changing shape this way. A spectacular example of that is seen in the financials. 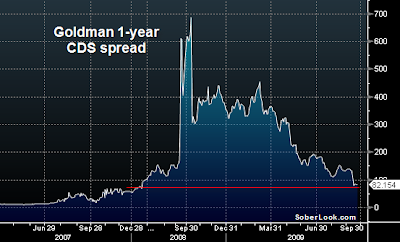 Consider the Goldman 1-year CDS spread. It is now at pre-crisis levels. According to the market, the government has succeeded in taking out the risk of a major financial institution failure. 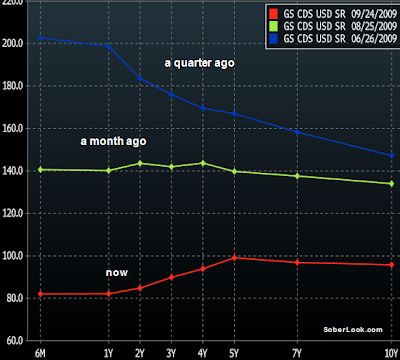 And here is what the Goldman CDS curve looks like now, a month ago, and a quarter ago. 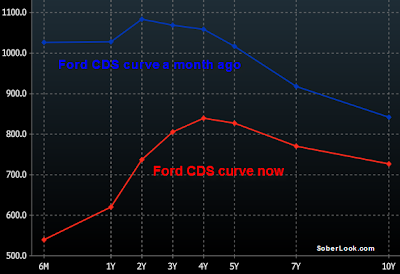 These moves in CDS curves are unprecedented. The markets are saying that in the corporate sector we are close to being back to the pre-crisis "normal". The question of course remains as to whether this is justified by the fundamentals or sustainable.